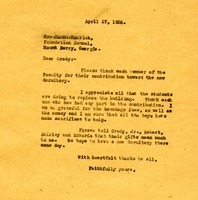 Martha writes to Mr. Oches that they have recieved his letter with contributions from several people thank him for his assistance in gathering gifts for the school. 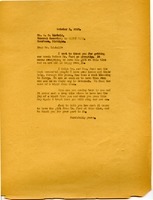 She also encloses the letters of thanks for those who gave gifts for Mr. Ochs files. Letter thanks Miss Moores for her interest and her gifts. 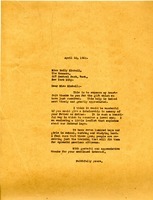 Mrs. Mitchell responds to an appeal letter from Martha Berry which expresses her appreciation for the Mitchells' past gifts and appeals for a $150 scholarship. Mrs. Mitchell's secretary responds with a $5.00 donation and a request the the schools sign and return the receipt. 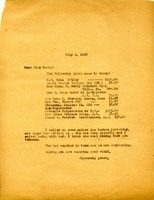 Martha Berry writes to thank Emily Kimball for her gift and ask her to give a Scholarship in memory of her father and mother. 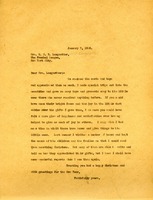 Martha Berry writes to Mrs. Langzetter thanking her for sending the cards and toys. Her gifts were given to the children in the mountains for Christmas. Miss Berry is thanking Mrs. Lawrence for her continued interest in Berry and for her contribution. Mrs Donnelley encloses a $25 gift and expresses an interest in the young people of the south. Martha Berry shows her appreciation to the Recipients for their past support of the Berry School. She explains that One Hundred Fifty will keep a student in school for a year. She asks for the recipients support. 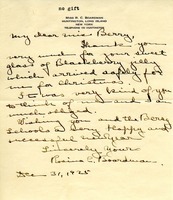 Miss Berry writes to Mrs. Brown thanking her for the gifts that have been sent to the schools in the past. She hopes that Mrs. Brown will send another gift, and any gift will be appreciated. 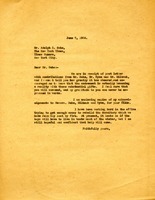 This letter contains information on what gifts came in on this date.